Tristan of Saint Albans is an orphan foundling, raised by the monks and with no idea who his birth-parents are. Despite this, he’s happy enough living in the monastery, and is given a good education by the time a group of Templar Knights arrive on their way to the Holy Land. One of them, Sir Thomas, takes an interest in young Tristan, just as another, Sir Hugh, takes an immediate dislike. To Tristan’s astonishment, Sir Thomas offers him a job as his squire and by the next morning, Tristan is leaving with the other knights to the Holy Land and King Richard’s war to regain control of Jerusalem. On the voyage there, and in the ensuing battles that take place in Acre, Tristan finds out that the Templars — and in particular, his master — are in possession of some of the most sacred relics of Christendom: the Ark of the Covenant, the One True Cross and the Holy Grail. It is the Holy Grail (as you may have guessed from the title) that Sir Thomas bequeaths to Tristan, urging him to return it to the safety of Rosslyn Chapel in Scotland. So, Tristan’s solo quest begins as he escapes the besieged city of Acre in the attempt to smuggle the Grail back to its rightful place. The story is roughly divided into two parts: Tristan’s journey to the Holy Land (or Outremer, as the Templars call it) in which he learns the ways of Knighthood, deals with the bloodshed and futility of war, and gleans knowledge as to his mysterious birthright; the second part involves Tristan teaming up with two unexpected companions and trying to warn the city of Tyre of an impending Saracen attack whilst escaping enemies of his own. Keeper of the Grail rushes along at a break-neck pace, from St Albans monastery, to Dover, to the Straits of Gibraltar, to Acre, to Tyre, to the open ocean once more. It takes no more than two pages to get from England to the Holy Land, so give the author credit for not wasting any time! 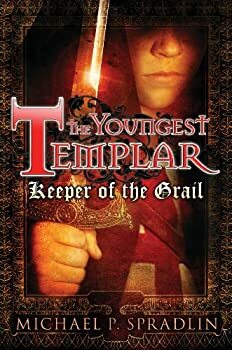 Reluctant readers, especially boys, will get a lot of mileage out of Keeper of the Grail, with a young, relatable hero, plenty of action, clear and simple prose, and an underlying sense of mystery. The story is told in first-person narrative, and Tristan makes a nice enough — if somewhat bland — hero. There’s not much in the way of historical information here. That is, everything is consistent and researched, but unless one knows nothing about the Crusades, it’s unlikely that a reader will pick up anything they don’t already know. But again, credit must be given for not including any needless lecture-like “info-dumps” into the narrative. It does, however, include a map of 12th century Europe and the route of Tristan’s voyage. The most notable feature is perhaps Michael P. Spradlin‘s inclusion of several “cameos” by characters from the Robin Hood legend: Brother Tuck and Little John, as a monk and a blacksmith respectively, and then “Robard Hode” and “Maryam” as two travelers that join Tristan on his journey home. Robard is a young man traveling home to England once his conscription is over, whereas this version of “Marian” is actually a Saracen assassin who attacks the two of them and then chooses to guide them to safety… though why she decides to compromise the war tactics of her own people in order to help two strangers that she initially attacks is a bit of a mystery. One thing that may annoy some readers is that Keeper of the Grail ends on a cliffhanger, requiring the next book in the trilogy (Trail of Fate) to be on hand for any immediate satisfaction. Cliffhangers always annoy me, and I’m afraid I’m going to take the opportunity to vent about my pet peeve on this review for an otherwise harmless little book. Owing to the relative slimness of the book, there is no reason whatsoever that The Youngest Templar should be divided into three, except that the publishers can collect three separate profits from each installment. It annoys me that readers have to seek out (and spend money on) three separate volumes in order to get a complete story, and if you are a voracious reader then it’s difficult to keep the details of the story in one’s mind during the long wait for the next publication. The Youngest Templar is a promising story — it’s just a pity that this is only one-third of it.